The University of Melbourne's School of Chemistry Collection contains reels of two historical cinematic films. Ernst Hartung (Chair of the School of Chemistry 1928-1953) and Leonard Weickhardt (Chancellor of the University 1972-1978) made the film Colloids in the School of Chemistry in 1934. It is known that as films age they slowly deteriorate. 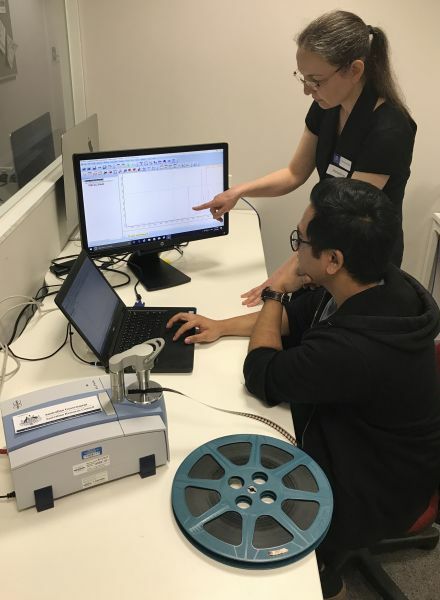 As part of a third year student research project with the School of Chemistry (in collaboration with the Grimwade Centre for Cultural Materials Conservation), Naufal Shukri investigated the chemical composition of the film using modern infrared spectroscopy methods. Environmental factors impacting on the deterioration of cinematic film were also examined. Naufal’s research demonstrated that high humidity and light are significant factors leading to film degradation. The heritage Colloids film was found to be cellulose acetate based. Fortunately, while some chemical deterioration was detected in the form of vinegar syndrome (or acetic acid), it is in good condition overall. Knowledge gained from the project will inform the safe storage of this important heritage film for the future. This research was supported fully by the Australian Government through the Australian Research Council’s Linkage Projects funding scheme, A national framework for managing malignant plastics in museum collections.